Whether you grew up watching Style with Elsa Klench on Saturday mornings on CNN, MTV's House Of Style when Cindy Crawford was at the helm (Her daughter's carrying on the family tradition circa now with beaucoup runway shows and endorsement deals.) or you're living on Instagram because it's your fashion bible (and you're a super fan of Something Navy), Fashion Week tix are probably on your wish list. The thing is unless you're Cindy C or Something Navy (or Chia Ferragni, aka the blonde salad), it's a lot less glam IRL than it looks in any of those mobile uploads, Insta Stories or Snaps. 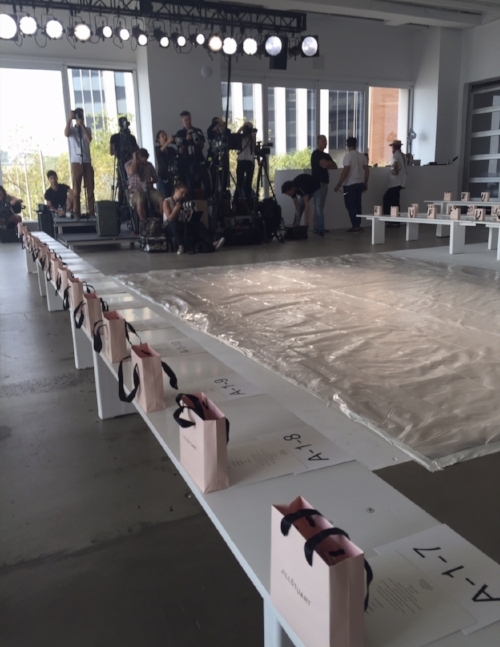 So, with that being said, here are a few behind the scenes secrets and essential tips we picked up during our NYFW adventure a few seasons ago that not everyone talks about, that you should def know before you even think about going. Be sure to bring along one of those tiny rechargable batteries (Everyone, especially those under 40, is either in a scrolling trance, glancing up clandestinely to see if you are in fact "somebody" OR snapping mad pics with their smart phones.) and a pair of flats or sneakers for walking around. For the record, Eva Chen wore sneakers and mom jeans to a Tom Ford show once, but she's probably the only high profile person who could pull that off and still be considered fashion royalty. **Also, the only ppl wearing sky high heels and on trend Fall outfits have door-to-door car service - with a/c blasting because it’s still summer hot outside - and an assistant or glam squad in tow. You can pick out the old school fashion editors and big shots in the audience because they are the ones looking tres annoyed by all the other people scrolling or snapping phone photos non-stop. On the one hand, I get where they're coming from, but honestly, never has 'Pics Or It Didn't Happen' been more applicable. I mean, it's freaking Fashion Week and we need some proof that we were there. So, Team Phones Up it is you guys! Why Uber Pool (ride share with a bunch of strangers) when you can summon an Uber Black? Zoom around The Big App in a glossy black town car, suv or Cadillac sedan? But of course! Also a great way to use those AMEX points that you never seem to have enough of to redeem for anything remotely fab. (Ummm, no joke, you need 'like' a half million to get an airline ticket.) Full Disclosure: It's not available here in RI yet, but we wish it was. *This post has been updated and revised from one that appeared on the blog in 2017.